I love long weekends, don’t you? On Saturday we did some shopping and picked up the husband some new shirts and ties. Then we headed on over to my sister-in-law, Erin’s house to visit and see my in-laws. Saturday evening we attended a surprise birthday party…but it was so cold (we went from 90 degree weather to 60s in just days) I totally forgot to take pictures! It was like and old man’s motorcycle complete with three wheels and a steering wheel. It drew a crowd for sure. And then some people walked by with some big birds. Of course I had to hold one. 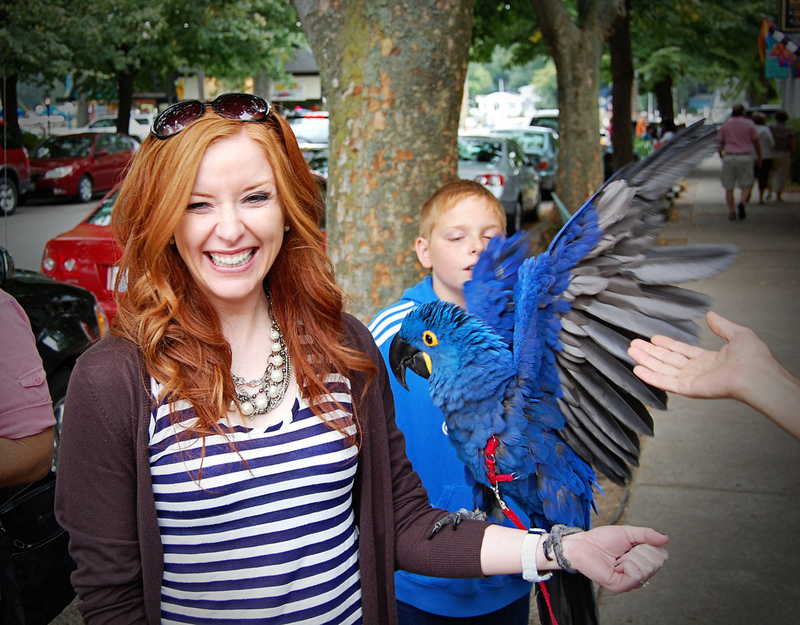 Birds totally terrify me….but this one was okay…until he started flapping his wings! After dinner we walked by the water and then headed out to this fun bar that is right on the water…what was it called? Red Dock maybe? 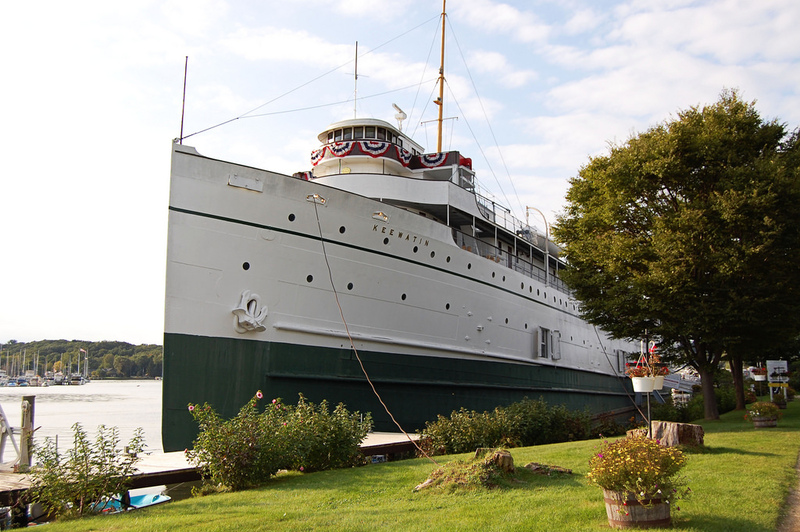 There was a big boat there. 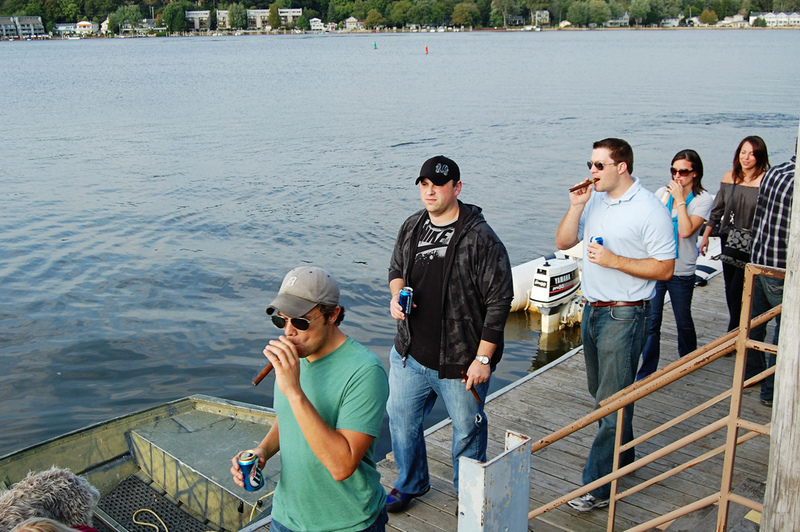 The boys (Will, Joel, and the husband) bought cigars and took a little smoke break on the dock. Yuck. I hate cigars. But they had fun I guess. And I have zero pictures of the girls. Geeze I had one rum punch and I couldn’t think straight…so no pictures. Sorry Geori and Amy! We’ll have to all get together soon…we had a great time! After our fun day out we came home and let Wrigley have a play date with Rye, the dog across the street. They were crazy but had fun. On Monday we lounged around, did a ton of laundry, grocery shopping, and gave Wrigley a bath. It was so nice to have that extra day! I hope you had a great weekend! Why is it so hard to go back to work after having Monday off??? 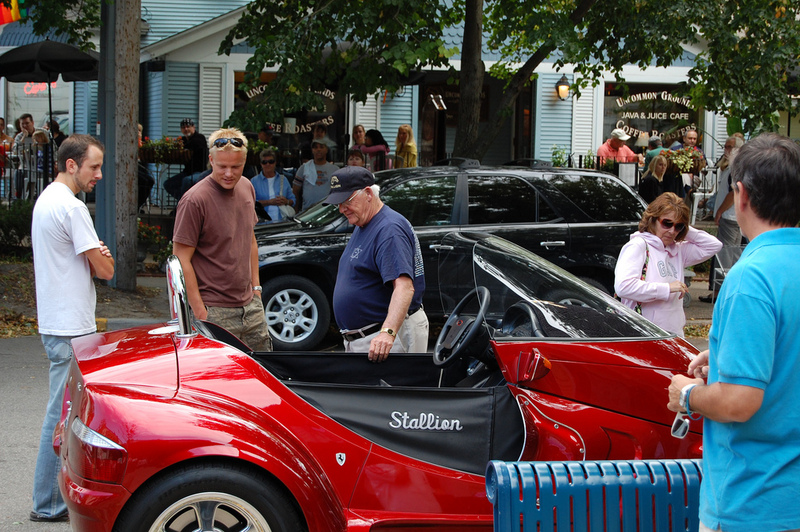 The grandpa motorcycle is called a "stallion"……..what a crack up! Would love to see The Cake meet that big blue bird!! 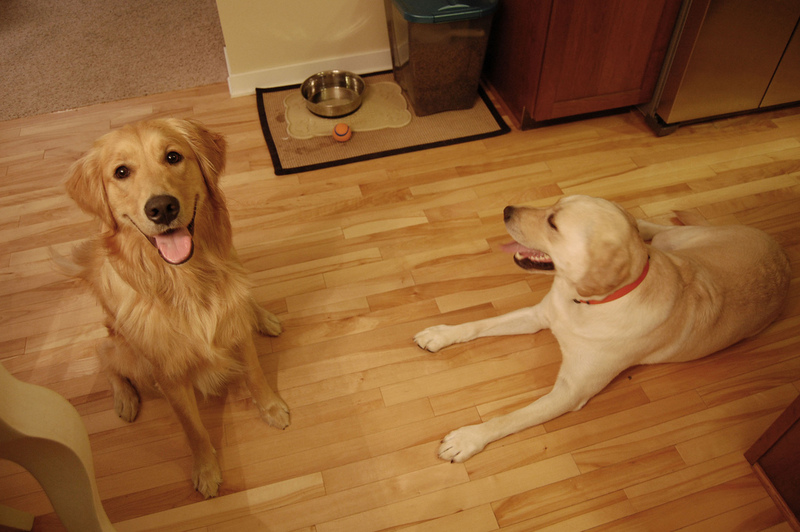 It looks like you had a busy, fun weekend…..and the pups look really happy, too! omg. i ADORE the picture of you smiling with the bird. its so so so cute! sounds like the perfect long weekend! I love the pic of the bird! Its beautiful! What a great long weekend. 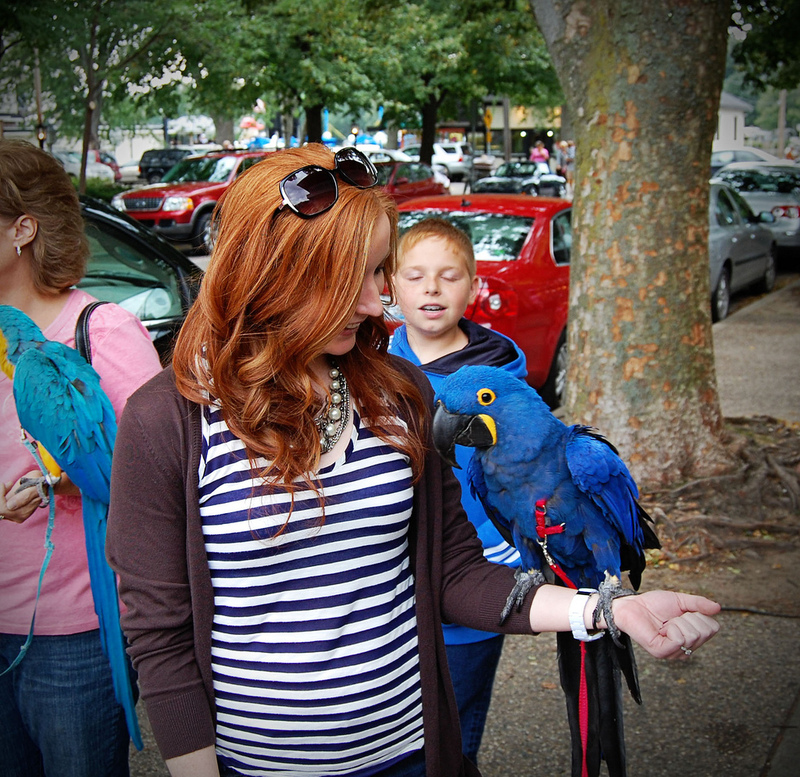 I cannot believe you held that huge bird, you are way braver than I am!! That bird is SO SCARY! You are a brave girl! That sounds like such a better long weekend than our crazy one!! So fun!! Love the picture of the puppy dogs! Glad you had such a nice long week-end. It was good to see you & Jon. Hope you have a great, short week ! Love Love Love your bird picture. It's so cute. I love it.